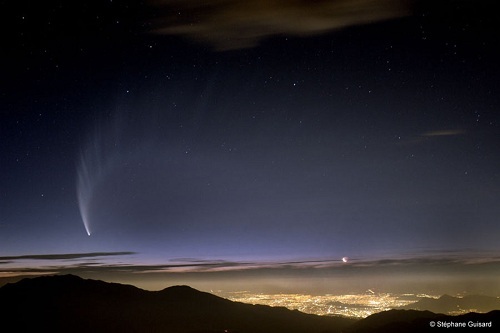 Image: Comet McNaught, possibly an interloper from another star, according to recent work. Credit: Stéphane Guisard. The process works like this: We believe the Sun formed in a cluster containing hundreds of closely packed stars. Each of these stars would have formed its own population of comets out of its circumstellar disk, and most of these comets, including those in our own infant system, would have been ejected by the gravitational effects of newly forming gas giants. Moving out into the cluster, they would have eventually been captured by other stars, just as our Sun would have captured its own share of comets as the cluster dispersed, the hot young stars blowing its gases into the void. The paper is Levison et al., “Capture of the Sun’s Oort Cloud from Stars in its Birth Cluster,” published online by Science June 10, 2010 (abstract). Having them all come from the same birth cluster conveniently gets around the issue of whether such alien comets would have substantially different chemical compositions. Hal & his crew have been working on this one for a few years, so it’s probably a fairly solid result. Of course we’re talking about “other stars” made from the same birth nebula as the Sun, so very likely very similar in gross composition. Does seem to indicate there’s a lot of loose cometoids out between the stars too. This should certainly give an extra boost for panspermia theories. Mars? Feh – we could find cousins in another star system! This begs the question of the distributions of these bodies in local space and the galaxy as a whole. Stellar Oort body migration would also be continuous because stars move in relation to each other as our galaxy rotates. Perturbations in these regions occur with a stately slowness, but these are spherical distributions, not belts, and the potential numbers of Oort bodies are likely as high around other stars. If “our system produced comets, but not enough to account for the Oort’s entire population”, then other stars must have gotten the short end of the stick, so to speak. Why would our system be so blessed as to receive much more than its share? Is this discussed in the paper? Also, if the Oort cloud really “swarms in a vast sphere that extends half the distance to Alpha Centauri”, then should it not be counted as interstellar medium rather than belonging to the solar system? If halfway to Alpha Centauri is not interstellar, than what is? I had the same thought as Mike Prather about panspermia, although now I’m thinking the separation from other stars was pretty complete before life started to develop. The chemical precursors of life would be pretty widespread though if comets carry them. Re what Eniac said, maybe the authors mean each system grabbed more comets from the interstellar medium of the original cluster than they would have formed individually? Not clear on that either. I’m curious as this is the first time I’ve heard about the sun having hundreds of siblings… does anyone know what stars our sun was born with? Can their paths be traced back to the stellar nursery? At last astrophysicists begin taking the environment of stellar birth clusters into account. This will be more difficult and even more fascinating than just researching stellar systems in isolation, and it will be necessary to explain the various forms of systems we observe. – The Sun was formed about 4.57 billion years ago. – The Solar System has completed 20 to 25 orbits of the galaxy. Because of the milkyway’s mass inhomogenities and because of turbulences, I have no idea, whether it’s possible tracing anything back. I wonder also. It would be absolutely one heck of a finite element analysis problem, a many body dynamics problem , a CFD problem, and a electrodynamic-hydrodynamic-plasma physics problem to trace the precise origination and evolution of our stellar siblings. My guess is that quantum perturbations might wash out even given the butterfly flapping its wings effect or sensitivities of evolved classical systems to initial conditions. We would need one heck of a map to determine the spatial temporal distribution and evolution thereof of our stellar siblings. Perhaps super computers in the decades or centuries to follow will be up to the task even if quantum computers do not pan out. Much of future astronomy is going to involve mapping, past, present, and future, especially with regards to our long term interstellar and hopefully, intergalactic travel infrastructure. I just want to make it clear that this in no way supports or boosts “theories” on panspermia. It may inspire someone to think about panspermia, but there is NO scientific data that supports or that can even be gathered (at this time) for a panspermia hypothesis to be tested… and I would argue no current observations support the creation of a serious panspermia hypothesis. Although, I will acknowledge that many people like to speculate about panspermia and how it might (have) occur(red). The formulation of a panspermia hypothesis, given the current evidence, is on par with the creation of a religion. I have no problem with religion, but that is not science. They are distinct, although both may deal with stories of creation and origin. Even if they’re outside of current science speculations about panspermia are not groundless. As long as they are consistent with what is known about the natural universe, and do not invoke the supernatural, they are legitimate from a rationalistic perspective even if there is currently no evidence for them. They may even give us a place to start looking for evidence. On the same not as a couple of other posters, I wonder that if the Oort cloud continues half way to Alpha Centauri, then, presuming a similarly sized cloud for that system, would the comets ever migrate from one system to another? Could they have a stable orbit that takes in both systems? Why other stars? Why does a star need to be involved? Zen: Panspermia (or any kind of “spermia” for that matter) involves the transference of materials from one place to another which may have the potential to carry the building blocks of life or even life itself. If there has indeed been any such transference to or from our system, then there is room for speculation, which is where science has always begun. Theories do not come out of a vacuum, but from speculating on possibilities and then pursuing the avenues which might yield the best data. Einstein never actually traveled at light speed, nor could he have ever, but by imagining the possibility of doing so, he created a theoretical framework which continues to be borne out by just about every bit of data we can find. That’s not only good science, but the best we have. Interesting question. After I read your above response, my thinking is that perhaps there does exist such a sharing of orbits wherein for stars that are not gravitationally bound such as our Sun and the Alpha Centauri System, perhaps there exists one to several orbit sharing iterations, wherein as the next star comes in relatively close contact with the Sun, another comet sharing situation will arise, and on. I would imagine that the duration of each comet sharing event would be on the order of the effective overlap of Oort Clouds which is probably on the order of a few tens of thousands to at most one hundred thousand years for stars that pass close to each other but which do not gravitationally bind to each other. JJ, either way, your speculation is interesting.